You may have wondered exactly how companies can determine the rate of growth in data usage on phones. After all, it’s only with that information that people can make informed recommendations to you on the amount of data you need in your plan. There are many ways to establish this sort of statistic. One of the most useful and readily available is a tracker called the Cisco® Visual Networking Index (VNI). The NVI tracks global mobile data traffic through its comprehensive forecasting tools. 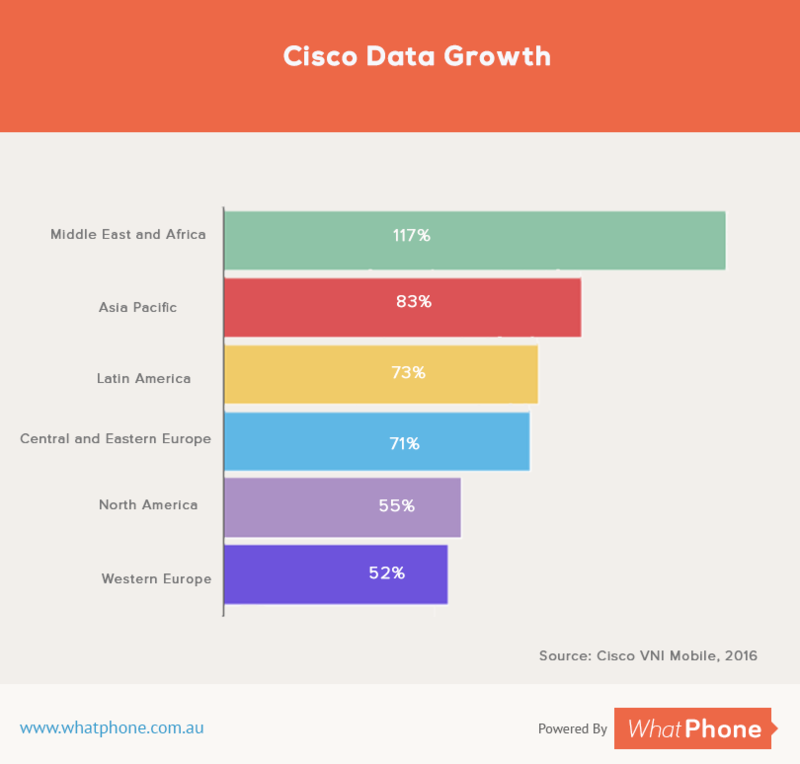 Cisco’s tracking tool has revealed that there has been an unprecedented increase in the quantities of data used in phone plans. That applies to both data only / mobile broadband plans, as well as data inclusions in more standard SIM Only or prepaid plans. Those figures are in line with Australian research from the ACCC, source, below. We also include reporting from ‘OpenSignal’ which is Australian based. One of the main factors contributing to the explosion in data use is the proportion of faster ‘fourth-generation’ (4G) connections in Australian phones. 4G connections made up only 14% of Aussie mobile accounts in 2015, but they accounted for 47% of mobile data traffic. 3G, the predecessor, represented 34% of all mobile connections but carried only 43% of the data traffic in the same period. That means the average 4G connection carried six times the traffic than a connection that was not 4G. Increased data consumption on 4G devices is mainly due to the fact that most 4G enabled phones are high end products. More expensive devices, the ones with 4G connections, tend to have larger screens, which are themselves more expensive to make. Bigger screens are associated with higher than average use. People watch more video and use their data facilities more often on newer iPhones than older iPhones, for example. The overall increase in data traffic goes hand in hand with an increase in connection speeds. Users are spurred into wanting to tap into data if they know the speeds are good. It’s no coincidence that speeds rose 20% in 2015 to a whopping 2,026 kilobytes per second (kbps), while in 2014 the speed was around 1,683 kbps. Additionally, increases in the quantity of data downloaded are accentuated by parallel increases in use of mobile applications. We have accepted smartphones in to our culture at a fundamental level and rely on our phones in every aspect of our lives. The telcos providing these facilities are not just determined to meet customer demand. They can see the profit incentives too. Australian service providers (that’s phone companies) are quickly rolling out 4G networks, in order to meet the rise in the demand by the end-users for more bandwidth, faster mobile connectivity and increased security. 4G is growing so fast that by 2020 over 40% of all global connections and devices will be 4G enabled. That amounts to 4.7 billion 4G connections by 2020. Video use on mobile devices took 55% of the total of mobile data use in 2015. Uninterrupted video viewing is only made possible as connection speed increases. Video use in 2015 topped 929 MB per person, while in 2014 it was a mere 648 MB. Video represented 97% of all data movement. In 2015, there were an additional 563 million mobile devices, mainly smart phones and connections that came online, around the world. This in total numbers is 7.9 billion devices. Smart devices are those that have mobile connections and advanced computing and multimedia options. Apple’s ‘iOS’ mobile devices, (including both tablets and smart phones,) were just ahead of Android for data usage in 2015. This was particularly noticeable in Western Europe and North America. In 2015, the number of tablets with mobile connectivity features rose 30% to an ownership of 133 million devices globally. Each tablet accessed 2.8 times data traffic than did the average smart phone. This meant that 2,576MB of data were used every month compared to smart phone’s 929 MB. Africa and the Middle East will show the greatest mobile traffic data increases. WiFi is often a cheaper alternative to cellular data. This means that Wi-Fi traffic from mobile devices and Wi-Fi-only devices will make up around 53% of total IP traffic by by 2019, an increase from 41% in 2014. Up to now IPv4 has been providing addresses for current protocol devices which they use for communication purposes on the Internet. These addresses have virtually all been used up but the better IPv6 protocol provides extra benefits where all devices will have on the Internet a worldwide routable public IP address. IPv6 has 340 undecillion addresses which will help smart devices as well as the Internet of Everything (IoE) become a reality. It doesn’t take too much to realise what 5th Generation or 5G is, as it is likely to be the next stage for mobile technology. The gains over 4G will be increases in bandwidth which will exceed 1 Gbps, far broader cover and an ultra-low latency. While 4G has been rapidly on the move due to the availability of more devices and the need for better information access, 5G will be largely driven by its relationship with IoE applications. It is envisaged that 5G technology should be better equipped to find solutions to spectrum management issues and frequency licensing. There is no certainty about the financial benefits of rolling out 5G and nothing is likely to happen at this stage until post 2020. We can all sit back and relax, at least for the moment, with our current 4G compatible communication devices. OpenSignal, a company which tracks mobile data usage much like Cisco, have an extremely ingenious way of determining their statistics. They don’t use geographic coverage or overall population. They gauge their figures on the amount of time that their app (which the user has to have installed on their phone) can access 4G networks from the device. So, how do we compare ? Australia fairs well in the global data stakes. We are in 8th position for 4G speeds with averages of 32.5Mbps. 4G is available to 79.34% of the Australian population, putting us in 13th place globally. 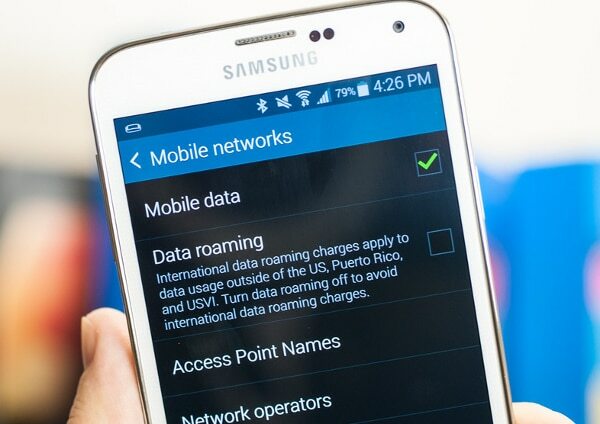 South Korea leads the field with 95.71% of their population able to access 4G networks at any one time. The U.S. offers their users 92.03% coverage while New Zealand trailed in 55th place globally, offering availability to just 57.8% of its population. When it comes to speed, Singapore leads the way with breakneck speeds of 45.86Mbps and New Zealand offering average speeds of 34.94Mbps. Optus recently announced its expansion intentions for its 4G network in Canberra, through the use the 1,800MHz spectrum it secured at the auction of the Australian Communications and Media Authority (ACMA) auction, earlier on this year. The telco spent a total of AU$196 million. Vodafone has followed in the steps of Optus by upgrading its network at 84 Canberra sites with its 1,800MHz spectrum. Vodafone’s CEO, said that through its investments the telco had gone through a range of upgrading in its attempts to offer better reliability, performance and speed, and performance competing favourably with its rivals. Telstra hasn’t been left dragging its feet either and has concentrated through its 1,800MHz spectrum of boosting its 4G network covering 200 additional sites in South Australia and North Queensland. The portion of the 700MHz spectrum that was auctioned in 2013 by ACMA is used for extra 4G mobile broadband covering long distances. Australia’s 3 main telcos continue battling with each other to upgrade their users to faster and faster 4G networks. The proportion of Australians covered and the proportion of those users with 4G phones is constantly increasing. We’ve accepted the new technology in to our lives quickly. The majority of Australians consider mobile data, voice, and video a necessary ingredient in their lives. Super fast mobile data speeds are now used extensively by both individual consumers and businesses. For smartphone users, the ramifications are clear. Keep an eye on your data usage and know when to change plans. As the statistics from these reports show, the amount of data we use is increasing month on month. Growth of around 70% per year is a level of increase we don’t expect elsewhere in our lives. Imagine, for example, if your mortgage or electricity use increased at that rate… ? It’s easy to get caught out, using more data than your plan includes. Make sure you know your data usage and cover it with the right plan.